The award was given by UNDP-Government of India. On the occasion of the Conference of Parties to the Convention on Biological Diversity, held in Hyderabad and attended by more than 170 countries, it was decided that the best protected area in the host country would be honoured with this award. Consequently, nominations were invited. As many as 150 parks from all over the country were nominated. Ultimately, five were shortlisted from the nominations. Based on the recommendations of a jury panel, the members of which made field visits to all these parks, Kanha National Park and Periyar Tiger Reserve (PTR) were nominated for the award; PTR was adjudged the winner. The jury comprised eminent personalities and M S Swaminathan was the chairperson. PTR was selected on the basis of certain holistic criteria like protection, participatory management, community-based tourism and issue management like pilgrimage and tourism management. Our major challenges are the Sabarimala pilgrimage during the months of November to January, when almost 10 million people visit the buffer zone of the park, which causes ecological disturbance and a lot of littering. Managing and regulating tourism is also one of the challenges. For managing Sabarimala pilgrimage, a Sabarimala Master Plan has been designed by the Devaswom Board or the Sabarimala Temple Trust Board which is to be implemented in consultation with the forest department. The plan envisages that there should be no construction in Sannidhanan, which is where the temple is present. All private vehicles should wait at Nilakkal and then shuttle buses would take pilgrims to Pamba from where they can walk three kilometres to Sannidhanan. There should be proper incinerators for waste disposal. Most of Periyar is inaccessible to tourists because of its difficult terrain. Despite that, what are some of the problems that tourism causes for the department. How do you go about tackling these problems? Yes, tourism in Periyar is highly regulated as only 30 sq km of the park is open to tourists. We have a limited number of boats at Thekkady where tourists take a boat ride in the river. Hence, no matter how many tourists turn up, the number of them ultimately taking the boat ride is limited. But there are issues with respect to the congregation of visitors like managing vehicles, littering, waste disposal and the sewage reaching the park. Therefore, we need to have a proper sewage treatment and plastic recycling system. We have already submitted a project for PTR to the National Tiger Conservation Authority. The project has three components: a two-year plan, a five-year plan, and a 10-year plan. Within the two year plan, we would like to have an interpretation facility, carrying out studies on invasive species, monitoring management of tourism, infrastructure development and eco development programmes. The five-year plan would include establishing anti–poaching camps by taking into account locals, which would complement the understaffed department and improving the community-led ecotourism initiatives like nature walks etc. The 10-year plan would mostly deal with monitoring the effective execution of the two-year and five-year plans. What are some of the research gaps in the reserve that you would like to flag to scientists? Some of the research gaps can be: studying the ecological impact of tourism and pilgrimage on the park; devising proper waste management methods; inventing methods for invasive species' eradication; much of the lesser known species of flora and fauna have largely remained undocumented and unstudied. We will facilitate and extend our support if researchers are willing to take up these studies. 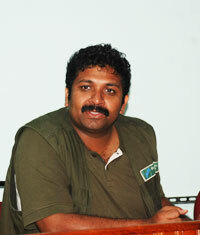 I am feeling proud that some Good work is being carried out in Periyar and you are party to that. Keep it up since you have lot of scope to do different things differently. Wish you the best luck for implementation of your own ideas for the betterment of the area under your jurisdiction.